By adding together sinusoids we can begin to create interesting synthethic timbres. Well, more interesting than plain sine waves. I’ve included examples of how to do this in PD and SuperCollider. I attempted to do this in both languages to get a better feel of the differences and similarities between them. PD feels sluggish by comparison, manually connecting lots of [osc~] objects can get tedious quickly. That said, @poperbu, is going to send me some patches that show how to connect things dynamically in PD. I’m looking forward to giving that a try. 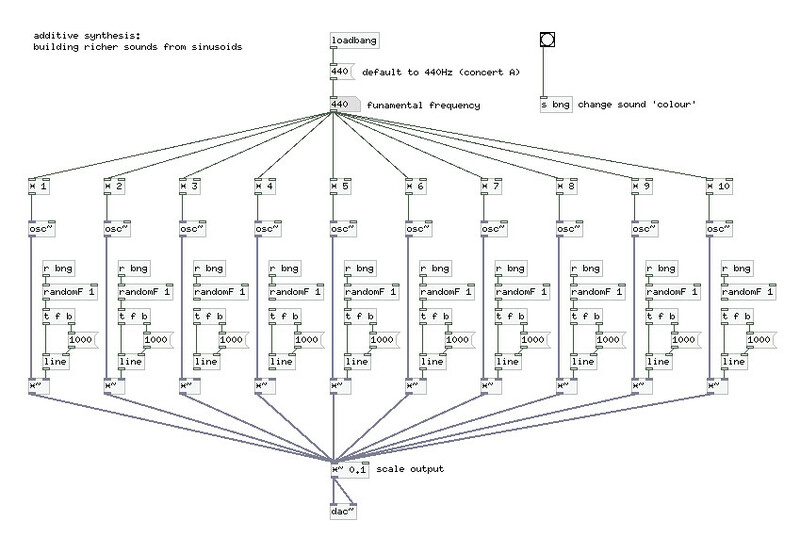 SuperCollider, on the other hand, is starting to get really exciting. There are some Ruby-like control structures in there that I’m really interested in exploring further. EDIT: Another, even slicker, way!